I mentioned recently in my strings article that I was going to talk about string tension differences between string-through-body and top loader guitars, and this is it. First, some explanation on what I'm talking about. What is a string-through-body electric guitar? These are guitars like the Fender Stratocaster and Fender Telecaster where strings are installed from the back of the guitar that travel through the body, over the string saddles, over the neck, to the nut, and ends at tuner post. What is a top loader electric guitar? These are guitars like the Gibson Les Paul and Gibson SG where strings are installed all on top of the body. String installation starts at the tailpiece, then over the string saddles, over the neck, to the nut, and ends at the tuner post. What are the main differences between the two other than string installation location? Two things. Length of string used and break angle. Compared to a top loader, about 3 to 4cm of extra string length is used on string-through-body guitars to get it through the body. 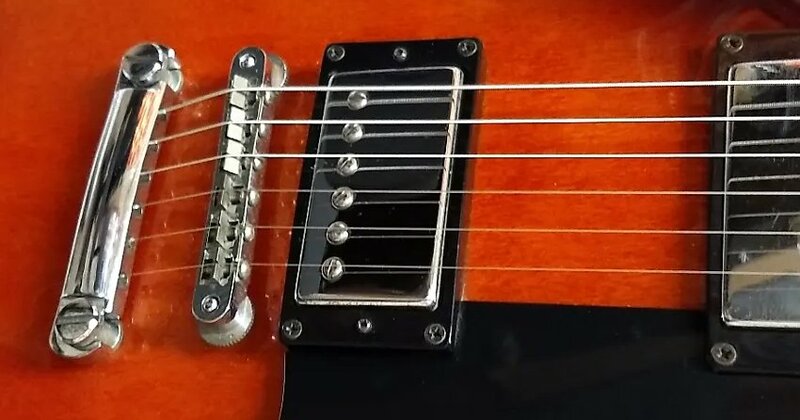 The break angle on string-through-body is sharp and has to be just to get through to the back of the guitar, whereas a top load guitar's break angle isn't sharp at all. ...top load guitars are easier to play compared to string-thru. An example of this on the low-cost end of things is the Squier Bullet Telecaster vs. Squier Affinity Telecaster. Same guitar shape, same number of frets, same neck material, same scale length, same single string tree holding down the B and high E, same string saddle type. Heck, they both even have the same "wing" string tree style, meaning the headstock side break angle is also the same. As far as two like-to-like guitars are concerned, this is as close as it gets. It is easier to play the Affinity. Why? Because the Affinity is a top-load while the Bullet is a string-thru. What do I mean by "easier"? The strings will be easier to bend on the top load guitar compared to string-thru. Nobody can seem to agree on what exactly makes the strings feel less stiff to the player on top load compared to string-thru. This is something people have been discussing and debating on the internet for over a decade. And absolutely nobody has come up with a straight, simple answer. Some say the shorter overall length of string on top load is what causes the looser feel. Others say the top load minimal break angle is what makes the difference. Others say it's both. And then there are those who say the difference in feel is all in your mind and that you're chasing after something that isn't there. This is what I say: YES, there is string stiffness difference I can absolutely feel between top load and string-thru even on like-to-like guitars such as the Telecasters mentioned above. This is not something just in my head, and I've played enough guitars enough to where I genuinely feel a difference between the two systems. Top load has a string feel that is less stiff compared to string-thru. Does this mean top load guitars are better than string-thru? What you can take away from this is that when guitar shopping, if there is a particular guitar you like but wish it was just "a little looser" or "a little stiffer" in string feel, consider the string loading system. If you want to feel more stiffness in the string, go with a string-thru-body. If you would rather have less stiffness for easier string bending, go with a top load instead. Top load Strat: Squier Bullet Strat HT. Top load Tele: Squier Affinity Tele as noted above. Top load short scale: Squier Bullet Mustang HH. The Affinity Tele is the one that catches most players off guard because they weren't aware you could get top loading Tele for so cheap, but yeah, there it is. Yes, it will feel different and the strings will be easier to bend. But you may really like it. Or you may not. You won't know until you try one.